Lucille O’Neal is a woman you know, a woman you understand. Perhaps your own journey resembles hers. O’Neal has been a rebellious teen, a single mother, a wife, a college student, a divorcée, and, above all, a woman of unique courage. Acquainted early in life with turmoil, O’Neal’s circumstances shaped her perspective and strengthened her resolve to overcome the challenges she would encounter later in life. She has endured poverty, rejection, abuse, addiction, and the illness of a child, yet today her faith and compassion for others are stronger than ever. O’Neal writes candidly—and often humorously—about her years of spiritual unrest and mental warfare, and her return to the God of her childhood. 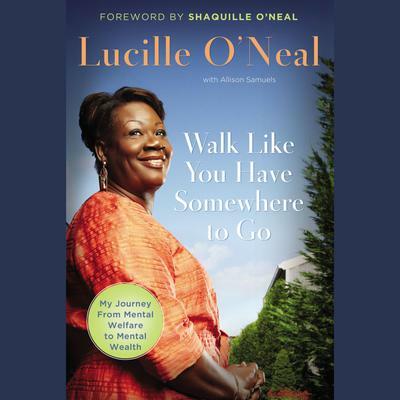 In Walk Like You Have Somewhere to Go, O’Neal shares her struggles and disappointments against the backdrop of her sweetest memories and proudest accomplishments. After fifty-five years, O’Neal has gained the wisdom to recognize her wrongs and guide others down a different path. Her story is proof that it’s never too late for a new beginning.